Laid Off Loser: Laid Off Loser Album of the Day: "Anti-Anti"
2006 was a fashionable year for post-punk. It seemed everyone who had ever heard New Order — or, more likely, Interpol — was suddenly reinventing themselves as brooding art rockers circa 1979. It got old, eventually, especially since the Killers never went away like so many of us had hoped they would. Going back and listening to this stuff, most of it hasn't held up very well. Snowden's Anti-Anti is an exception. This Atlanta — yeah, Atlanta, home of Southern rock and crunk — quartet seemingly came out of nowhere with this surprisingly strong debut. At first, Anti-Anti comes on like any other so-so post-punk retread, but spend some time with it, dive in a little deeper, and soon you can't get it out of your head. The shimmering guitars, throbbing bass lines and death-dance rhythms are all there, but unlike most Interpol knockoffs, Snowden effectively establish mood. It also helps that singer Jordan Jeffares isn't trying too hard to be Ian Curtis, and that his introspective songwriting explores situations and emotions with an air of the metaphysical. The approach has both hurt and helped the band, as none of the 12 solid tracks on Anti-Anti scream "radio-ready," yet they were clearly crafted and sequenced as individual pieces of the whole. That, in the end, makes for a more satisfying listening experience than a catchy throwaway single. 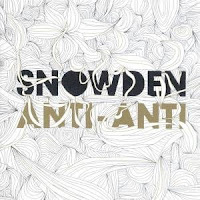 But perhaps the most harmful thing is, Snowden have seemingly disappeared since releasing Anti-Anti. However, their shell of a Web site has a promising announcement: "New album soon to arrive." Let's hope sooner is later.